Today I added a video on how to do the trace of your picture. It should help everyone figure out how I did the glass block. 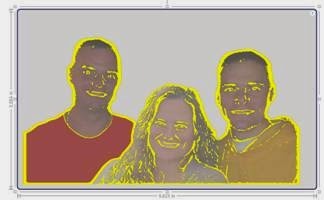 It makes it easier if you have a photo editing program, where you can remove the background around your image. Every picture is different as far as coloring and shading, so the setting in the video may need be the exact settings you will use. It is a trial and error situation. You may end up tracing over and over again till your happy with it. Just keep trying. Be sure to leave me any questions and I'll do my best to help you out. I've been doing vinyl for a while now, but I must of woke up the other day and felt like I could accomplish the world. I was thinking about my children and how proud of them my husband and I are. They of course, are now grown and all have families of their own. But from time to time, they seem to still need advice from their parents. It is great to still feel like they need us, but as we get older, we need them too. So I decided a few days ago I was going to practice my tracing skills in Silhouette. 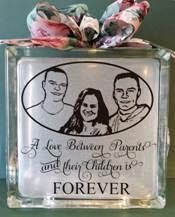 I grabbed a picture of my grown kids and decided I wanted to trace it and make a glass block. Adventurous, you bet. Crazy might be a better word. I think I actually traced the image at least 15 times before I found something I could work with. I opened my picture program and turned it into a gray scale image....ahhh, that might make it easier, wrong. I moved every setting in the tracing screen to something I thought would work. I decided after maybe 10 traces, maybe the original picture that was in color might be easier to trace, yes it was. Still doing a ton of adjustments to the settings. This is the closest I could come. At this point I had to decide was that close enough that I could clean it up, re-arrange the nodes enough, and make it not impossible to weed. These were the best settings for this picture I could achieve. So I traced the image and got ready to re-arrange, delete, etc. till my children actually looked like my children. A few weeks ago I share my 5 x 7 Card Gift Box with you. Since then on forums and Facebook, I've been asked how to make my roses that were on top of the box. I began making these over a year ago when all I had was my Spellbinders dies and machine. The die was great, but I could only make them all in one size. Well now that I have my Cameo, I've recreated the rose petals and leaves so that I could create them in any size I needed and any colors. Very Cool, right! 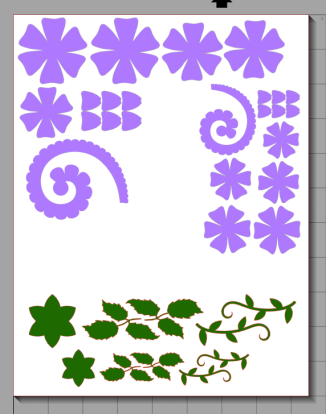 I've designed a Silhouette Studio file that will give you the pattern to create these roses. In the file I've included 2 sizes, the large and small one. The large one is about 2" in diameter and the smaller one is 1 1/2" in diameter, not including the leaves. It also includes 2 sizes of leaves. These can be cut on either the portrait or cameo. I've also shown you how to cut by color in the cameo, so if you aren't familiar with how to do that, be sure to watch my short video on that procedure. In the video tutorial, I will show you how to create one of the roses, as they all use the same procedure. Plus, I will also give you some tips about what tools work best, what to use to apply glitter etc. After you have watched the video, be sure to check out my links to the tools I like the best for making these flowers. These flowers work great on so many different items. Gift Tags, Gift Packaging, Shadow Box Scrapbook Layouts and a lot more. 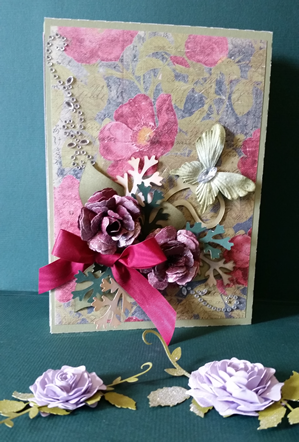 They also are beautiful on Hand Made Cards, although they are too high for the post office to deliver, so you must be personally giving the card. 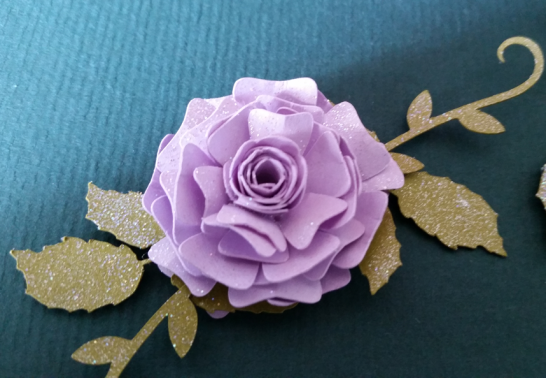 Just a word of advice, there are tons of people who make roses for their embellishments. Everyone seems to do it differently. What is probably going to happen to you is what happened to me. I watched tons and tons of videos, some of the roses took hours to make just one, others seemed to not look like a rose at all. Well, I came up with my own style as you may also do. The key here is to share! Oh, how time flies when you're having fun! Valentine's Day is just around the corner and while I've been so busy having fun creating all kinds of new things with card stock and vinyl, I realized I didn't have a card for the hubby for Valentine's Day. So over the weekend I had to create one, and while I did I thought perhaps it is one you all can use. 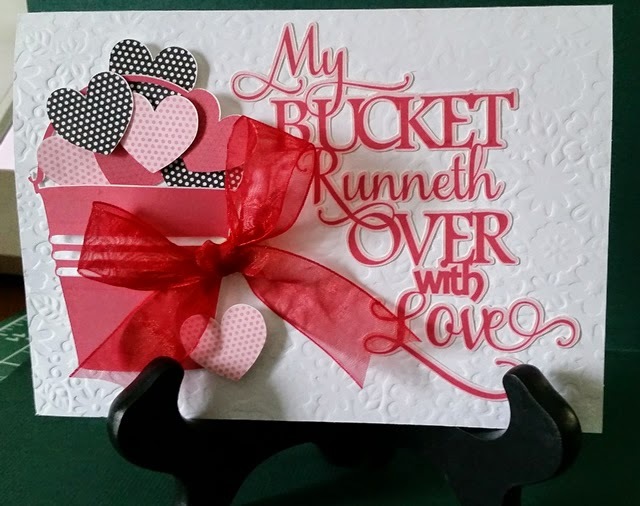 I created the "Bucket Runneth Over Card". It's a simple print and cut card created with the Silhouette machine. This can be created with the portrait or cameo. I've included the free Silhouette Studio file for you to download. I have printed and cutout everything on this card, but it doesn't need to be done that way. You can also use red card stock to cut parts of it out and printed paper to cut the hearts. There is a new video on my YouTube Channel that also shows you the simple way to assemble the card. Please be sure to subscribe to my channel to keep in touch with the new videos I add. Hope you enjoy creating this card. Boy, can we fill up our computers with fonts. Anyone that does a lot of designing on your computer seems to feel we can never have enough, right? So many fonts are similar to each other, that we often have to go through and clean them out. When you're looking for a specific font style to use on your project, you find a whole new world of fonts you have missed or never seen before. So that one font download now turns into 20 font downloads. Well I'm maybe going to add to that collection. I have created a list of my favorite fonts, and I'm sure I've found some of these because of other people's lists of their favorite fonts...so the list travels. 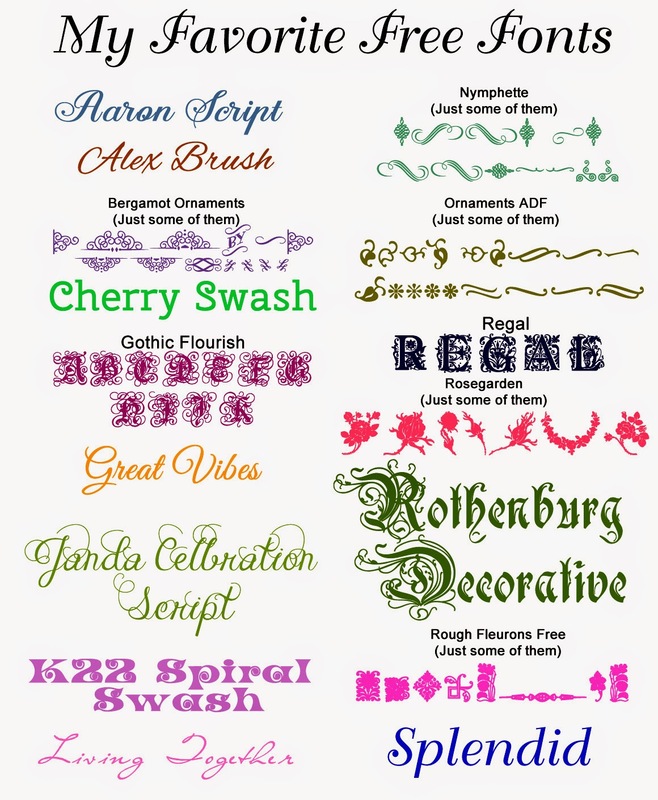 Most of these fonts can be found on http://www.dafont.com, which is one of my favorite places to find fonts. One question I have seen asked a lot in Silhouette forums is, "How do I install them in the Silhouette program?". There isn't any need to completely install into Silhouette Studio. If you install the font on your computer, it will show up in Silhouette. If you have your program already open when you install the font, you will need to close everything, and re-open the program to see that font.